Indonesia has big plans to upgrade its woeful infrastructure – but at a big cost. Enter Beijing. 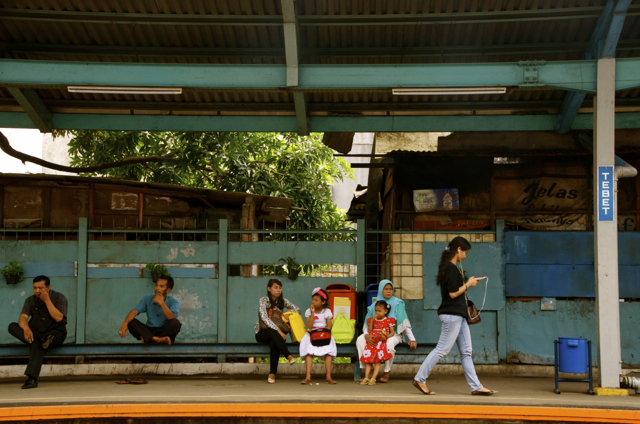 JAKARTA -Indonesia’s government hopes to double infrastructure spending in the coming year. China recently established a new regional infrastructure investment bank. And China, despite being Indonesia’s biggest trading partner, currently ranks only 13th as a source of investment: Japan invests six times as much, the United States three times. All of which suggests that there is much room for increased Chinese infrastructure investment in Indonesia. Handily, Jakarta is keen on the idea. In November 2014, shortly after taking office, Indonesian President Joko Widodo told the APEC Summit in Beijing that Indonesia wanted to build 24 new seaports, overhaul transport links and upgrade the power grid. “This is your opportunity,” said the president. And not only did Jokowi, as he is widely known, then confirm that Indonesia would participate in China’s new US$100 billon Asian Infrastructure Investment Bank (AIIB), he suggested the new lender be based in Jakarta. The AIIB is scheduled to start operating by late 2015 and is seen as Beijing’s latest attempt to challenge its rivals for influence in the region. The US and Japan, particularly, have long supported the work of the World Bank and Asian Development Bank, both of which have been major lenders to Indonesia but whose sway China wants to challenge. Earlier this month, and thanks largely to a windfall from the elimination of fuel subsidies, the Indonesian government proposed doubling capital spending on infrastructure to Rp290 trillion (US$23 billion) this year. That is just the start, however: if Indonesia is to upgrade its infrastructure adequately, the bill is estimated at US$500 billion by the decade’s end. It is colossal, but all necessary if Indonesia is to grow its economy at Jokowi’s hoped-for 7 per cent a year. Indonesia’s shoddy infrastructure is widely cited as a major hurdle to doing business in a giant archipelago 5,000 kilometres across and with 900-plus inhabited islands. For example, the Indonesian Chamber of Commerce and Industry reckons 17 per cent of a company’s total expenditure in Indonesia goes on logistics, while the East Java Freight Forwarding Association reckons that logistics costs add almost 30 per cent to retail prices, three times the global average. “The price of cement, one sack of cement, in Java island is US$6. But in Papua island the price is US$150 per sack of cement. Imagine, 25 times.” That was Jokowi, in Beijing again, emphasizing the day-to-day cost of laggard infrastructure. Probably the best-known Chinese infrastructure work in Indonesia to date is a bridge linking its most populous island, Java with the tiny island of Madura, near the second city Surabaya. Elsewhere, work should start soon on a multi-billion-dollar Chinese rail project across Kalimantan, and Chinese money may soon fund export processing zones for minerals. A year before Jokowi took office in Jakarta, Chinese President Xi Jinping oversaw the signing of US$28 billion worth of deals, taking in railway and port construction, mining and aircraft leasing. But development projects in Indonesia have a history of getting lost in a stew of bureaucracy, corruption, land-rights disputes, shifting policy priorities. Indonesia’s Investment Coordination Board says that only 6 per cent of the planned Chinese investment over the past five years has materialized so far. But money talks, and China has pockets deep enough to provide what Indonesia needs, with foreign exchange reserves nearing US$4 trillion. And China’s own economic model – where the one-party state can bulldoze ahead with projects – might well be appealing, in some ways, to an Indonesian government wondering how to manage the vested interests and rivalries that have often undermined development. Jakarta might also think itself big enough to hold its own against the grabby, exploitative side of Chinese infrastructure building and resource extraction, as seen in Cambodia, Laos and Myanmar. China has long been the world’s biggest spender on infrastructure, with over US$1 trillion in infrastructure upgrades lined up for this coming year alone. Unlike Indonesia’s current plans, Beijing has financed most of the outlay itself, though Jakarta is also hoping to set up an infrastructure bank of its own over the coming years. Speaking at a forum on Indonesian-Chinese relations last week. Indonesia’s coordinating Minister for Economic Affairs, Dr. Sofyan Djalil, cooed about the possible economic links between the two countries. “China is an important business partner. We have a good economic relationship with China. The Indonesian economy has changed now, so we open a lot of opportunities to China to cooperate and invest to improve Indonesian infrastructure,” Djalil said. Earlier this week, Djalil met Chinese Premier Li Keqiang, seeking Beijing’s backing for infrastructure projects such as industrial estates in Sulawesi and Kalimantan. “Following the meeting, both sides signed the Minutes of the First Meeting of High-level Economic Dialogue Between the Government of the People’s Republic of China and the Government of the Republic of Indonesia as well as a letter of intent for power station cooperation,” read a statement from the Chinese Foreign Ministry, following the meeting. If Indonesia and China are to establish closer economic ties, it will mean putting to bed a sometimes fractious history. The two countries only established diplomatic relations in 1990, after decades of mutual distrust. Indonesia’s Chinese minority has long been viewed with suspicion by other ethnic groups – seen as either traitors loyal to Beijing, or economic predators or would-be Communists – and at times suffering deadly violence at the hands of other Indonesians. And, even as effulgent statements were being issued about the potential for improved economic ties, China Foreign Ministry spokeswoman Hua Chunying was voicing Beijing’s concerns over Indonesia’s new tough policy on foreign fishing vessels caught illegally fishing Indonesia’s waters, and Jakarta’s revoking of a 2013 deal that benefitted Chinese fishermen over competitors in fishing in Indonesian waters. Speaking to media on Tuesday, almost as Minister Sofyan’s meetings in Beijing were closing, Hua called on the Indonesian government to “earnestly protect” Chinese enterprises’ investment interests and Chinese crew members’ legal rights, according to Chinese new agency Xinhua.